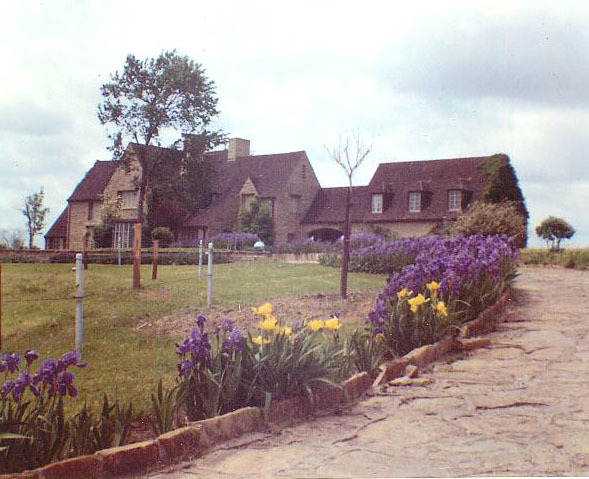 Dear Linda, After exploring various Tulsa websites I thought people would like to see a picture of the Ma-Hu Mansion that was on Memorial Dr. Most people today only remember it as a severely deteriorated haunted house but I knew it in its prime as it was in my family. The pictures I am sending can be used as you see fit. I knew every detail of the Ma-Hu Mansion and have some of its furnishings in my house today. Many, many interesting tales...The Indian relics museum in the basement that included Geronimo's daughter's buckskin suit. A full ceremonial Indian headdress given to John B. Queen by Chief Bull Thunder. The headband was made from Pat Hennessey's hat. The single long horn steer that roamed the property. His name was Rusty. The collection of exotic birds in the back buildings that included some very loud peacocks. I played my first trumpet recital for Aunt Mable and Uncle Hugh in the front room in 1964. Uncle Hugh had suffered a severe stroke and had to live with nurses care in this lower front room. But he was very receptive to this impromptu event. The Ma-Hu Mansion was home to "Scream in the Dark" Check out Stevo's site for more information. (Scroll down to find the Mansion's information). Read about the history (and photos) of this home after the death of its owners. Read the Tulsa World Article on the history of the house.